We absolutely fell in love with Adirondacks in Upstate New York. 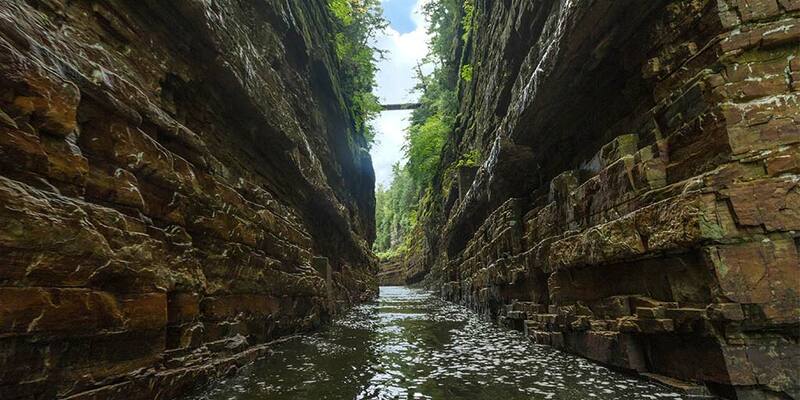 We explored so much of the region including Ausable Chasm and Lake Placid. 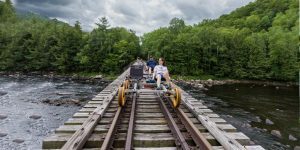 But throughout our trip, one of the things we were most looking forward to was our Adirondack rail bike adventure with Revolution Rail Co. in North Creek. There was just something that seemed so magical about gliding along an Adirondack rail trail under our own power. But the real questions was, how were the kids going to handle the journey?! Well, it turns out that whether under rain or shine (and we had both), a rail biking adventure is one of the most unique ways to experience the Adirondack Mountains. And even when the skies opened up and we were drenched from head to toe, the smiles just wouldn’t leave our faces. 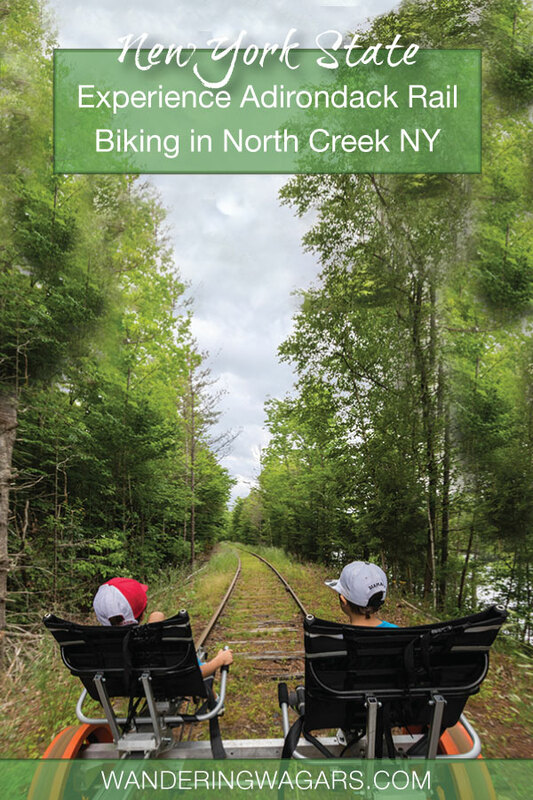 Revolution Rail Co. is a railbiking company based in North Creek NY. But what is railbiking? Well, a railbike is essentially a framed multi-person pedal machine. But, rather than being used on the road, a rail bike rides along the smooth railroad tracks that are already winding through the hillsides. The advantage of a railbike is that there is very little resistance on the metal rails. This means it takes a lot less work to ride a long distance on a railbike than it does on a traditional bike. And that’s good, especially when you have your kids along for the ride. 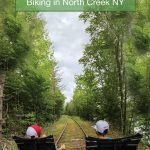 Our rail bike adventure started in North Creek NY. 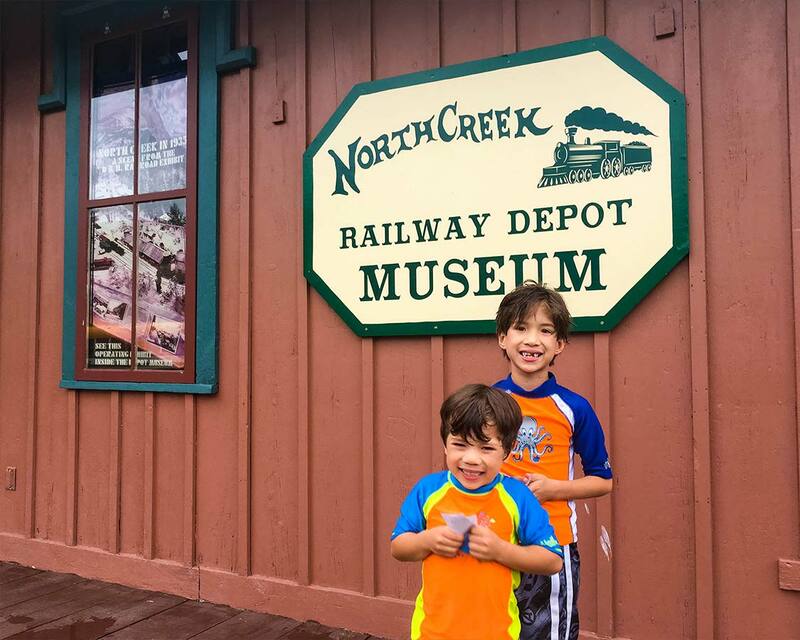 We pulled up to the North Creek Railroad Station. Here we registered ourselves at the Revolution Rail shop. Far from being a quiet, former railroad station though, the North Creek Railroad Station was a flurry of activity. The yard was full of old trail cars and engines. The boys watched with excitement as an engineer shuffled trains around the tracks. Loud clanks and chugs filled the air. The atmosphere was perfect for getting us in the mood for a rail bike adventure. Once we registered at the Revolution Rail Co. office we waited for our timed departure. Once the time came we boarded a school bus for a 5-mile drive out of town to the starting section of the Adirondack rail trail. We unloaded as the previous group was finishing their ride. The weather was cloudy but warm and there were smiles all over their faces. It wasn’t long before we were loading our little family up for our rail biking NY experience. Christina and I took the back while the boys settled themselves into the front seats. D was a bit small to reach the pedals. But the railroad bicycle seats move forward and back so he could just sit back and enjoy the ride. 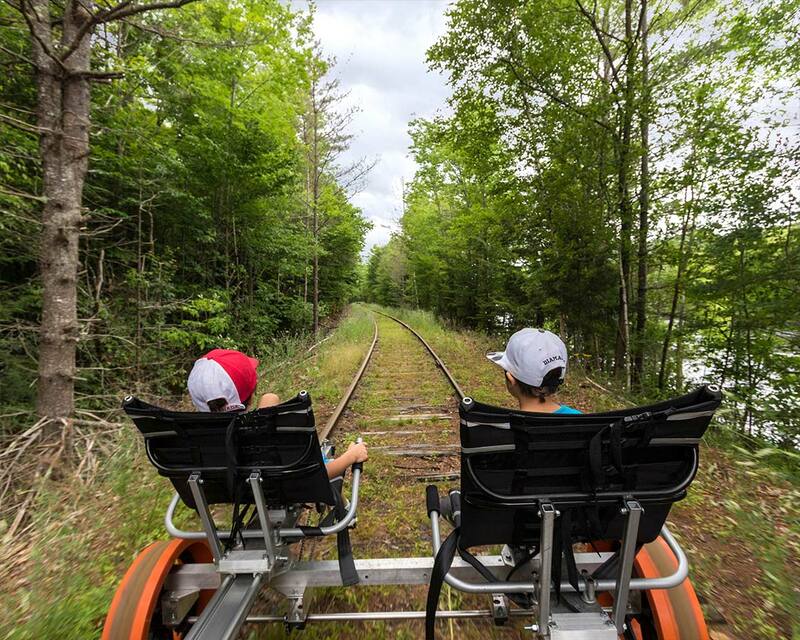 The Adirondack rail bike tour was perfect for the kids. They could chill out and enjoy the ride. They spent most of the journey up counting the butterflies and listing off the color of every flower they saw along the way. The rail bike through the Adirondacks was beautiful. The ride up has a slight uphill grade. But the shade of the pine and birch forest kept us cool from the summer heat. After one of the most relaxing 45-minutes of exercise ever, we arrived at a towering bridge spanning the Hudson River. The views were incredible. And all of the rail bikes slowed down to enjoy the view of the sparkling water below. When we reached the halfway point there was a bit of a break while the Revolution Rail Co. team turned the rail bikes around for the journey back to the starting point. While you can choose to stay and watch the crew do their thing, most rail riders head down to the banks of the Hudson River to enjoy the views. 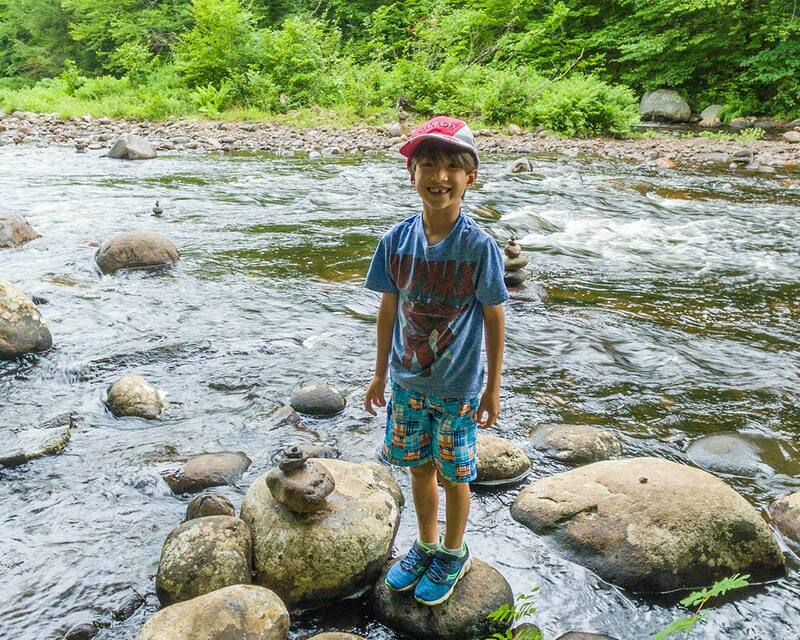 There is a small picnic area at the bottom of the hill, but the boys spent most of the time building small stone statues by the river. That was until the rain came. 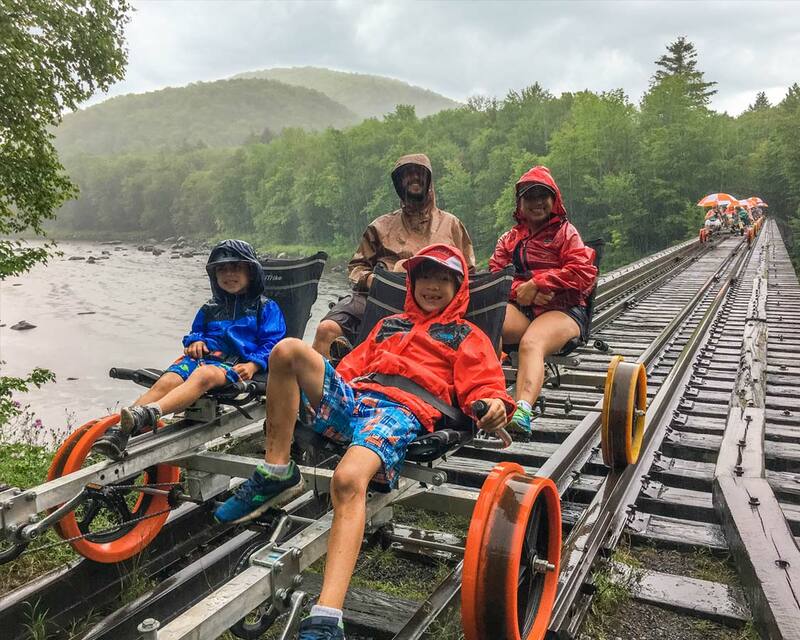 The Adirondack rail trail runs rain or shine, so we made our way back up the banks and waited for our rail bike to be set to go. As we made our way back over the Hudson River, the skies over the rail biking trail completely opened up. Luckily we brought our rain jackets along or else our gear would have been completely wrecked. But even with all of the rain, the journey back along the Revolution Rail was a treat. The way back has a downhill grade for most of the route. So even though we were soaked, at least the ride was a breeze. But it was obvious how much faster we were all working to get home out of the rain, as even when we arrived, we still had a 10-minute wait till the bus arrived with the next group of rail riders. Important Information About Rail Bike Tours With Revolution Rail Co. The rail biking tours book quickly. In order to book your excursion head over to their website here. 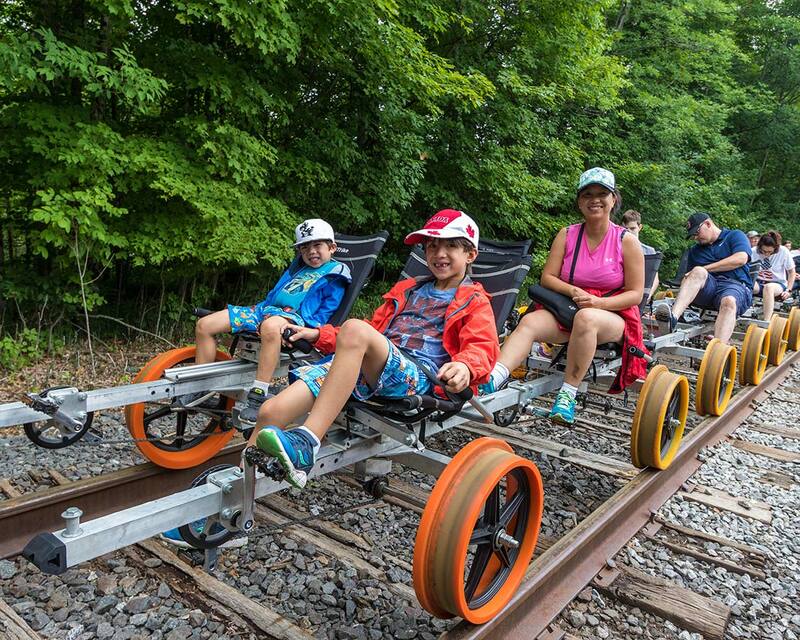 There is no minimum age for rail biking with Revolution Rail Co. Infants can ride in a front-facing child carrier. Children aged 4 and up can occupy a seat. Rail biking is suitable for most fitness levels. Although the railroad pedal cars are human-powered, they don’t require a tremendous effort to get into motion. Rail Biking with kids is a breeze. Revolution Rail Co. sets up their rail bikes so that kids of all ages can enjoy the experience. The seats slide back and forth so that kids that can reach the pedal. Younger children can push their chairs back and enjoy the ride. 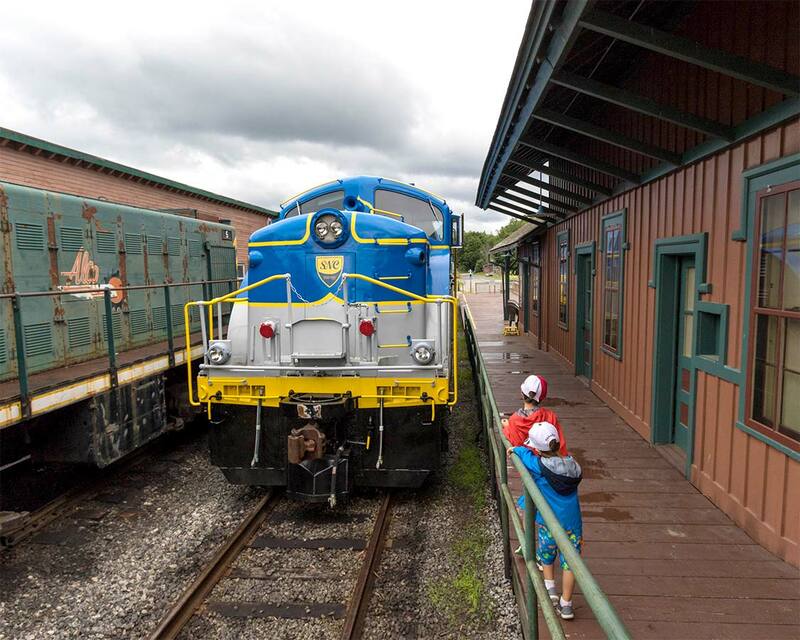 There are few adventure activities in the Adirondacks for kids of all ages to enjoy, but thankfully, rail biking is one of them. Should You Pedal The Rails With Revolution Rail Co? 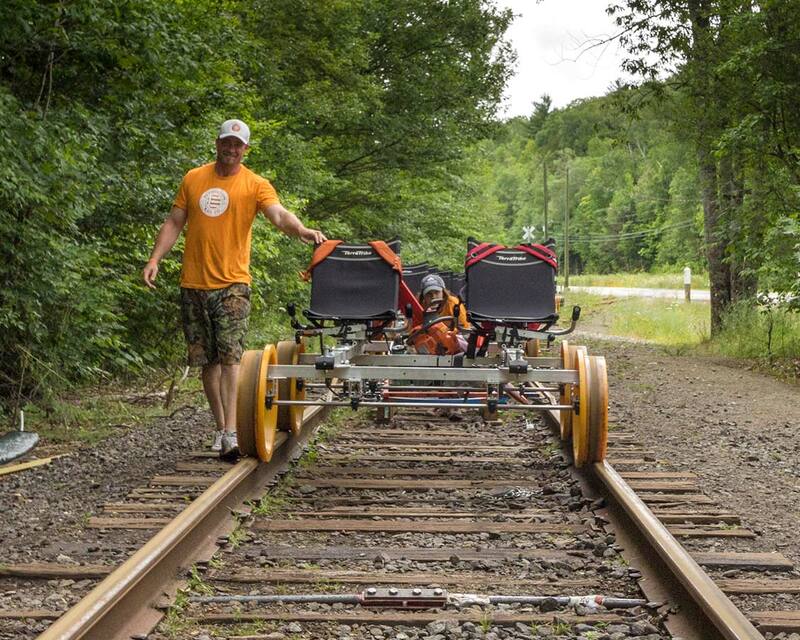 Our Adirondack rail bike experience with Revolution Rail Co. was a blast. Although we weren’t blessed with the best weather, we still had smiles on our faces through the entire journey. And it was obvious from the faces of the other people on the Adirondack rail trail that they felt the same way. Even as we all huddled into a shelter waiting for our bus back to North Creek, everyone was smiling, chatting, and having a good time. North Creek is located at the bottom of Gore Mountain. 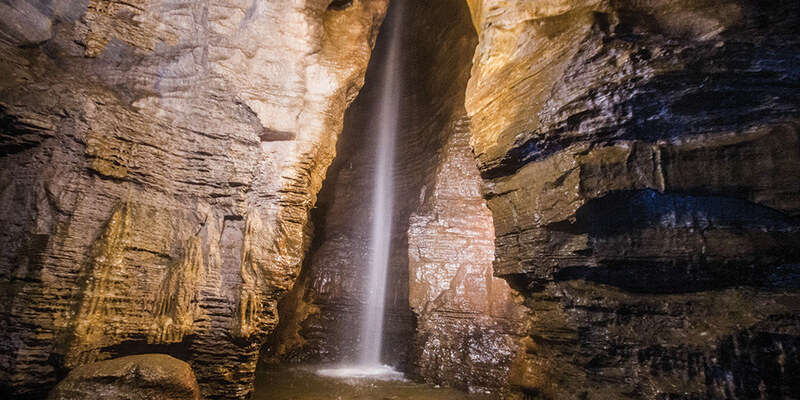 This tiny town sits near the Hudson River, and while it might seem like a sleepy town when you arrive, there are many things to do in North Creek and the surrounding area so don’t be afraid to explore. Lake George is under an hour drive from North Creek. 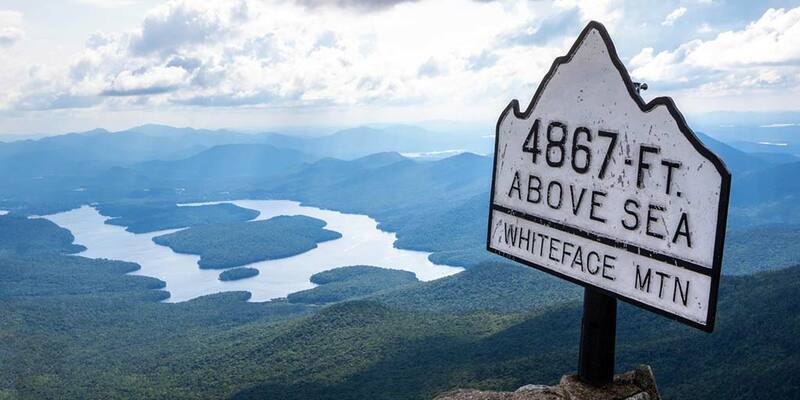 And while Lake George is famous for its skiing and winter fun, it’s also a popular destination for hiking and mountain biking. 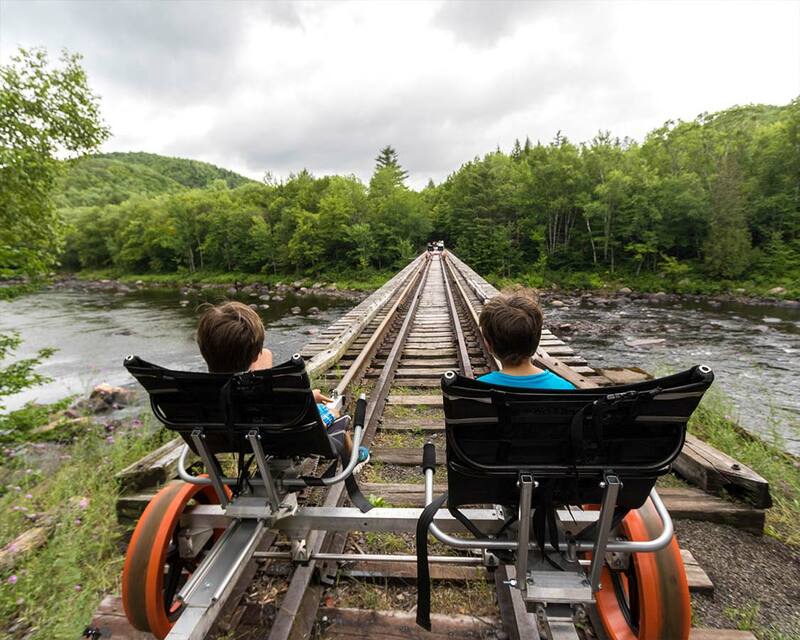 If the Adirondack bike railroad didn’t get your adrenaline pumping enough, don’t worry. North Creek is also a popular destination for whitewater rafting. During the summer the rapids on the Hudson River can reach class III. This makes for a fun day out on the water. 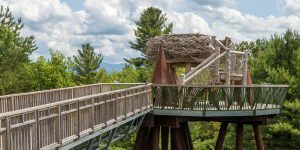 Just over an hour from North Creek is the famous Adirondack nature center, the Wild Center in Tupper Lake NY. Not only does it feature one of the coolest treetop walk experiences in the USA, but it also has an amazing museum and great walking trails. You can read all about our experiences at the Wild Center with kids here. The small size of North Creek New York belies how many restaurants there are here. In fact, North Creek is a burgeoning foodie spot thanks to its location amidst some of the most popular ski areas in the Adirondacks. Here are a few of the best North Creek NY restaurants to check out after your Adirondack rail bike tour. Chrissy’s Cafe on Main St. in North Creek is a popular lunch spot for both locals and visitors. They are open for both lunch and breakfast as well. If you’re looking for great coffee or a light bite to eat, check out Cafe Sarah. It’s also on Main St. in North Creek. The Barking Spider is great for adults, but it’s not really built for families. This bar is heavy on the brews but has a small food menu as well. For something a little more involved head to the Inn at Gore Mountain. Not only do you get the great views of the mountains, but the meals and wine pairings are excellent. If you decide to stay in North Creek NY for a few days and check out all of the great things to do in North Creek, you’re in luck. There are some great North Creek NY Lodging options for couples and families. Here are some of the best options for hotels near North Creek NY. The Alpine Lodge in North Creek has a cozy, homey atmosphere. It also has a beautiful outdoor lounge with a fire pit. Perfect for watching the stars. The Alpine Lodge also includes a continental breakfast. Gore Mountain Lodge is one of the top-rated hotels near North Creek NY. Make sure to stay for the Bavarian style meals at the in-house restaurant. Gore Mountain Lodge also includes free WiFi. If you really want to treat yourself though, check out The Fern Lodge. It’s about 13 miles from North Creek in Chestertown. And it’s located amidst some of the best fishing in the Adirondacks. The Fern Lodge has an outdoor hot tub, water sports facilities, and free WiFi. Have fun on the rail biking! I would love to hear from you how the Old Forge experience is. I’m hoping that we have a chance to do that rail bike sometime soon. 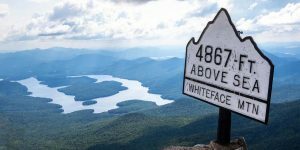 Your opinion of the Adirondacks is echoed by so many who live there, and we are so lucky to have had the opportunity to return again and again. You definitely need to check it out! And the fall is the perfect time to check out the mountain colors! I’ve been to the Adirondacks years and years ago and they were beautiful! My hubby and I have been talking about taking the kids to the East Coast for awhile now and I know they’d love this! Thanks for sharing your experience. It sounds like a fun challenge and adventure for a family. I’ve never EVER heard of rail bikes so this was an eye-opening read!!! It sounds like a fantastic day out with the kids, and one we’d love to try! LOVE rail trails. There’s an awesome one near Providence, RI, too!